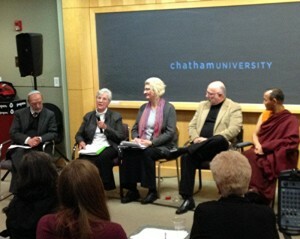 Sister Madalyn Chlebowski was a featured speaker and panelist at Chatham University in Pittsburgh which was the site of an interfaith program, Contemplative Practices to Help the Dying. 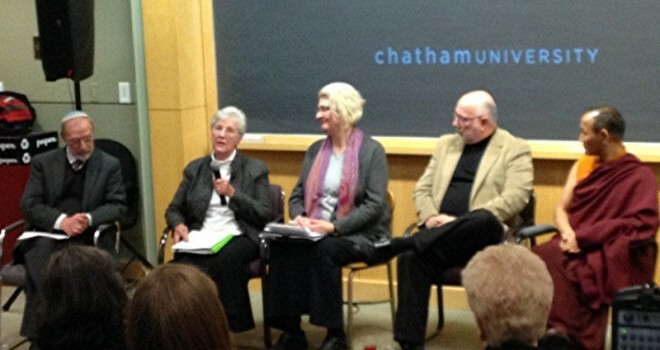 The two-day event, Nov. 21-22, 2014, presented a multi-religious, multi-cultural discussion on death and dying. The audience comprised caregivers and professionals in hospice, hospitals, and long-term-care who serve individuals who are dying . An emphasis in the presentations was placed on the importance of knowing the faith, customs, beliefs , and practices of the dying person in order to address these end-of-life issues in the healthcare systems. It was an enriching experience.